Welcome to the Colorful Fabric Collage Blog Hop to promote my good friend Sue Bleiweiss and her newest book! This photo is of the items in the giveaway! So exciting. Comments on all blogs count.The book will be shipped from Interweave, but if you are international, you will get an electronic eBook, instead of the actual book. The winner will be announced on May 15th. I am pretty happy and honored to have an art quilt in Sue's new book! 12x12 Love What You Do, with my classic trailer and bunting flags. My fabric line "Home is Where Your Story Begins" by Hoffman Fabrics. All of the fabrics were pre-fused with Mistyfuse, and then collaged together to create this piece. Here is the back, so you can see the free motion machine quilting. My quilts are all made the same way. Black wool blended felt for the foundation, and backed with a fun color of wool blended felt. National Nonwovens TOY002. No batting, no binding. If you've been following my blog, you know that I am a big fan of Mistyfuse. It is my 'go to' fusible, because it doesn't change the hand of the cloth, and you can sew through it beautifully by machine or by hand. This is what a 10-yard pack looks like. Oh, Yes! I want this book. I have Sue's video and she is a really good teacher. I would love to add this book to my studio library, thanks for the chance to win! I'm already on inspiration overload. This is my first ever blog hop. I will never get anything done in my studio as I will be reading everyone's blogs!! Love your colorful blog. Would love to win the giveaway. Both Sue's book and your quilt look delightful! Thanks so much for sharing this. Everything you do makes me smile! Looks like a great book and package! I'd love to win! I always enjoy your posts. Nice giveaway. I am always amazed by your work! This book looks wonderful too. I would love to have the book. Your quilt is so pretty, love the bright colors. Jamie, As you know I adore your work, bright and happy! Which is why I also follow Sue, another bright and happy quilter. I would love to learn the techniques that Sue teaches and this book looks like it may just do that! Thank you for the chance to win a copy! I have never used Mistyfuse - I am going to have to get some. I don't do much fusing, but with all this inspiration I am going to have to start! I so enjoyed watching Sue on The Quilt Show as her work is so inspiring. Really want to win Sue's book but if I don't, I'll just have to buy it... just have to wait and see after the 15th. I love your work too; you inspire me. So many good ideas! Thanks.. THis just looks like so much fun! Just watched Sue's appearance on the Quilt Show with Alex Anderson and it was great; I imagine her book is, too. And Look! You're on the Mistyfuse packaging. How cool is that?? I love your piece so much! What a fun technique. Lots of possibilities! I love the great colors! felt as batt and backing, an interesting option. I too love misty fuse, would not use anything else. Your color sense and Sue's have a lot in common. I love bright. Fun quilt! I like your use of felt as a backing, eliminating the middle batting; just wish there were a plant based felt. Sue's book looks great! Your quilt is so vibrant! And I agree- Misty Fuse is a great product. Great color, Jamie -- your quilts make me smile. Thanks for the giveaway. would love this book.. The colors speak to me!! 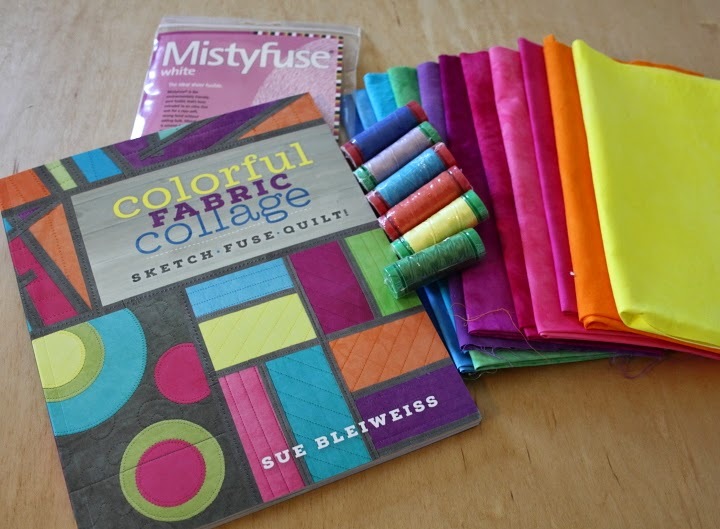 I haven't tried Misty Fuse but you have me convinced to try it so I can make these happy colorful quilt stories. I'm new to quilting and would love this book to learn different techniques. Congratulations on being included! Thank you! sure would be fun to win this. Misty Fuse is a wonderful product. One of my favorite fusibles too. Congratulations on being included in Sue's book. I've never tried Misty Fuse but would love to. And the book looks great too. Your technique of working on wool blended felt is really different. And I love Misty Fuse!! I have Misty Fuse but haven't tried it yet....love your work Jamie! I find it interesting that you use no batting and no binding when you make your quilts. LOVE the way you used the selvages to create your label!!! Thanks for sharing an interesting new-to-me idea and congrats! on being included in Sue's new book. Your trailer and flags piece is so cute. Thanks for sharing some of your processes and materials and thanks for the chance to win. Cute art piece! Your technique sounds interesting and the book sounds wonderful. you always have something new to entice us! Love your trailer! Thanks for sharing the technique. Very gun, want to try. I love the camper quilt! It is my dream to live in one when we retire. Great quilt, it's so colourful. I haven't tried mistyfuse. I love the bright colors in the "Love What You Do" mini quilt. Sign me up to win, the book looks great. Thanks for the giveaway - I would love to win this prize! I'd love to try Misty Fuse-what a great giveaway package! The book looks really fun! This is such a cool prize - you could get stuck in straight away. Thanks for a great giveaway! Love all the colors. I am all about color and bright projects! Just the cover of this book inspires me! Would love to win! I like Sue's style a lot, and from what I have seen of this book online, it looks like a wonderful resource! It would be great to win it! I would love to have this book. Thank you! Sew colorfull. Love this! Would love to win,sew colorful! I would make good use of this package! Thanks for this opportunity! I've never tried Mistyfuse before. Thanks for the chance to win! I would love to add this book to my library! thank you! What fun. I hope I win a copy of the book! the book looks great and the fabric looks yummy! Thank you for the introduction. Thank you for the great giveaway as well. Wow! GREAT review. Hope I win! Wow, this looks like a tremendous resource! Thanks for the shot at winning it! Sue is coming to my guild soon and I'd love to have the book. What a wonderful chance to win! Thanks so much!